Annapolis (United States) (AFP) – Struck by tragedy when a gunman with a grudge stormed their newsroom, journalists at a US community newspaper pulled together to put out Friday’s edition in tribute to their five murdered colleagues, targeted in the country’s latest mass shooting. 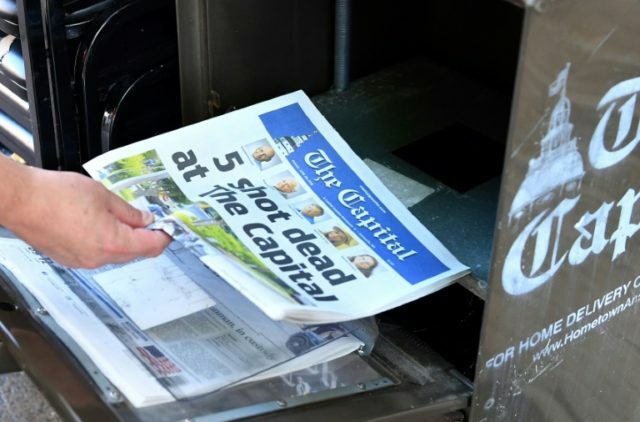 “5 Shot Dead at The Capital,” said the headline of the daily in Annapolis, Maryland. Inside, the editorial page declared, “We are speechless,” but was otherwise left blank in honor of those slain. Thursday’s shooting was one of the worst attacks ever to target journalists in the United States, and local media said police had stepped up security at other news organizations. A 38-year-old named Jarrod Ramos, who had a long-running dispute with the paper, has been charged with five counts of murder, according to court documents posted online by US media. He was appear in court Friday morning. Although police were still investigating motives in the case, The Baltimore Sun — which owns The Capital and helped its small team of surviving journalists put out Friday’s edition — said Ramos had feuded with the daily over a 2011 story covering a criminal harassment case against him. Police kept the sector sealed off on Friday as their vehicles went in and out as part of the investigation. Katie and her sister Kelly O’Brian arrived with drinks and snacks for the officers. Rob Hiaasen, 59, a former Baltimore Sun feature writer who joined The Capital as assistant editor in 2010 and wrote a Sunday column. Gerald Fischman, 61, “the conscience” of the news organization who wrote editorials for more than 25 years. John McNamara, 56, who pursued his dream as a sports reporter for the paper. Wendi Winters, 65, a reporter who “had a talent for connecting with the community,” according to a former editor. Rebecca Smith, 34, a recently-hired sales assistant engaged to be married. Anne Arundel County Police Chief Timothy Altomare told Fox News he knew each of the victims. But as he returned to Washington from Wisconsin Thursday night, Trump walked away when reporters asked if he had any words of condolence for families of the dead reporters. Davis said he was under his desk and heard the gunman reload. Chase Cook, another of the paper’s reporters, said Thursday that the shooting would not stop the daily from going to press. “We’re putting out a paper tomorrow,” he vowed as he typed grimly away in the shade of a parking lot, perched on the back of a pick-up truck. Altomare said investigators were frustrated as they tried to determine exactly why the gunman attacked. The killing of 17 people at a Parkland, Florida high school in February helped reinvigorate the national debate on gun control in a country where firearms are responsible for more than 30,000 gun-related deaths annually.